The Federal Trade Commission will hold off on its challenge of a West Virginia hospital merger while it examines a new state law that aims to protect the deal from federal antitrust scrutiny. The FTC's order issued last week delays for 30 days administrative law proceedings over Cabell Huntington Hospital's proposed acquisition of St. Mary's Medical Center; both are in Huntington. A hearing before an administrative law judge had been scheduled for April 5. The order follows the recent signing of a new West Virginia law designed to shield hospital mergers from state and federal antitrust review, assuming they get certain other state approvals. Some speculated the new law would cause the FTC to drop its challenge to the West Virginia merger altogether, and that the new law could inspire more states to pass similar legislation. “Withdrawing this matter from adjudication for a short period of time … will give us an opportunity to evaluate the impact, if any, of the state legislation without any adverse effects on competition or consumer interests,” according to the order. The FTC took action in November to block the merger, saying it would create a near monopoly on general acute-care inpatient hospital services and outpatient surgical services that would likely lead to higher prices and lower quality. 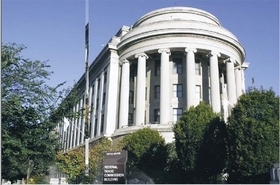 The two hospitals' leaders have said they believe the FTC challenge “misreads the highly competitive landscape” across their market, which includes parts of Kentucky, Ohio and West Virginia. They say the merger would help their community.